SETC operates buses from Cumbam to Chennai via Uthamapalayam Chinnamanur Theni Trichy Villupuram. The bus service is blessing to Cumbam and Theni for traveling to State Capital Chennnai. The bus operated for the service is a non ac variant with air suspension body and push back seat for passenger comfort. 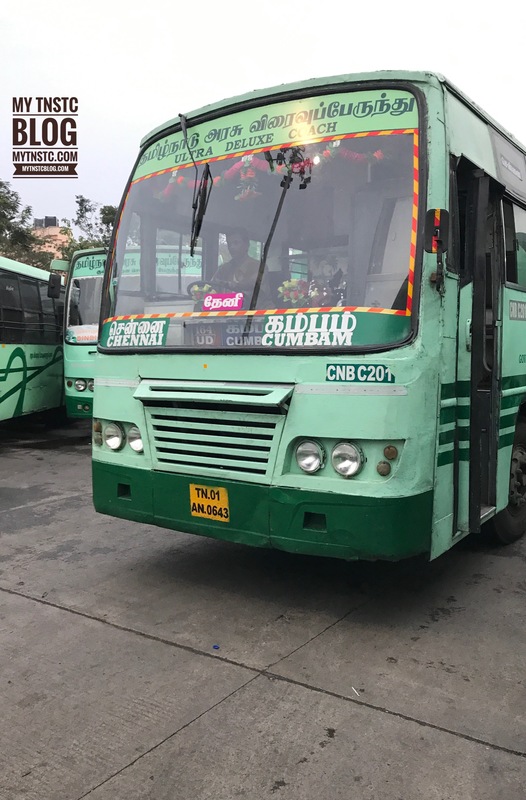 The bus starts from Cumbum bus stand and ends its trip at Chennai Moffusil Bus Terminal situated at Koyamedu. The bus route dedicated for this service is 172 UD and Total time taken to cover a distance of 533 kilometres is 12 hours. At present there are 5 buses operating with Online reservation facility. The buses to chennai depart from Cumbam at 5:30 pm, 6:00 pm, 6:30 pm, 7:00 pm and 7:30 pm. The passengers can book the tickets online from www.tnstc.in 30 days advance of travel. The 7:00 pm bus doesn’t have boarding point at Uthamapalayam Chinnamanur instead they have a boarding point at Batlaguntu. Passengers booking from Uthamapalayam Chinnamanur Theni request you to search Cumbam to Chennai and select boarding point as required. The ticket fare for the service is 385 per passenger excluding reservation charges.